Eyes of a Fire Keeper is a Key Item in Dark Souls 3. Can be given to the Fire Keeper in the hub version of Firelink Shrine. She will then offer to "remove fire from the world". Talking to Ludleth the Exiled while in possesion of the eyes will change his dialogue to explain the background story of the untended graves and the owner of the eyes. The effects of giving the eyes to the Fire Keeper changes the Firelink Shrine music, changes the Fire Keeper`s dialogue, as well as providing option of the Betrayal Ending. If the Fire Keeper is killed after giving her the eyes, the eyes will be returned to the player and then everything will become as if you had never given them in the first place. Note that you can still return the eyes to her after this happens. Found in the dark Firelink Shrine in the Untended Graves secret area. Located on the floor at the end of the lower west hallway behind an illusory wall, in the same location where the cleric, Irina of Carim, resides in the hub world. In some instances sending Irina of Carim to the Firelink Shrine before finding the eyes will cause the illusory wall and the eyes to disappear. These eyes belong to the First Fire Keeper, and Ludleth has been a Lord of Cinder in the past. Since he speaks about helping “her” cope with the visions, that implies that he was part of the first set of Lords of Cinder. This would also reinforce (but would not prove) the theory that he’s also one of the Pygmy Lords, but because he volunteered to become a Lord of Cinder, he wasn’t imprisoned with the rest of them. Enter a world of blueberries. 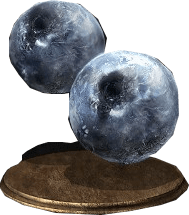 "Blueberries of the Firekeeper" Fixed. No need for thanks. Grant us eyes, grant us eyes! I hate this item, if you have these eyes and not going for the betrayal ending, it&apos;s either, &apos;is there something I should know&apos;, then you give her the eyes and it&apos;s all &apos;please kill me&apos; the moral to this story is? Don&apos;t talk to a blind person if you have eyes. WHen a girl says " i need someone who see fire innmy eyes and want to play with storm and fire what canni give her a answer ? I have a question what happens if you give the eyes to her after you&apos;ve defeated the final boss? Well looks like I can&apos;t level up anymore. I gave her the eyes like the dingdong I am and then had to kill her. I feel f*cking awful godammit dark souls. They look more like cookie monster zombie eyes! Honestly, call me weird, but I actually prefer the Ending The Fire Ending. It&apos;s messed up, but honestly, It needs to happen...Lothric is shredding itself apart. The Fire is already dying...and no Flame burns forever.